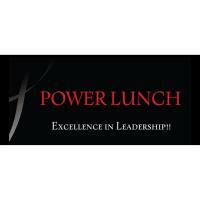 POWER LUNCH Motivation Workshop: Come get motivation and learn how to motivate others. There is excellence in Leadership. Power Lunch is a professional development workshop scheduled each month (Jan-Oct) on the fourth Wednesday for business professionals in the greater Pell City area. Mark your calendars because you will not want to miss a single 2018 workshop. Please RSVP now for the next workshop by calling Denise Miller at 205.338.7711 and visit our website for more info.